UNITED Nationalist Alliance (UNA) senatorial candidate San Juan City Rep. JV Ejercito Estrada again expressed his gratitude to the public this time for making him the biggest gainer in the February StratPOLLS Inc. survey. The February StratPOLLS’ Preferences for Senators showed that from a rank of 7th-8th in January, Ejercito Estrada jumped to 5th place. He was preferred by 70 percent of respondents, 10 percentage points higher than the share he obtained in the January survey. The StratPOLLS survey was fielded between February 4 to 12, 2013 in the National Capital Region (NCR), specifically in the cities of Quezon, Caloocan, Pasig, Manila and Makati. The young lawmaker credited his presence in UNA’s sorties in Cebu and in provinces in Luzon as well as the roving vans that played his campaign jingle for the big improvement in his ranking in the StratPOLLS survey. “Salamat po sa sambayanang Pilipino sa patuloy ninyong pagpapakita ng suporta sa akin. 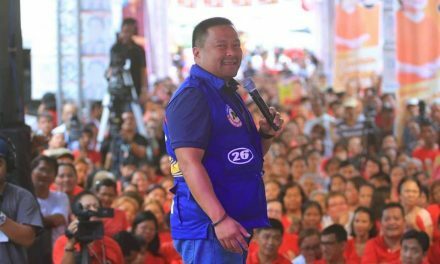 Gagawin ko ang aking makakaya upang mapaginahawa ang buhay ng mga Pilipino sakaling ako ay mapabilang sa Senado,” said Ejercito Estrada. In recent surveys conducted by the Social Weather Stations (SWS) and Pulse Asia, the San Juan Solon is among the top 5 senatorial candidates preferred by respondents. Ejercito Estrada said he hopes that the public will support his candidacy until election day on May 13.